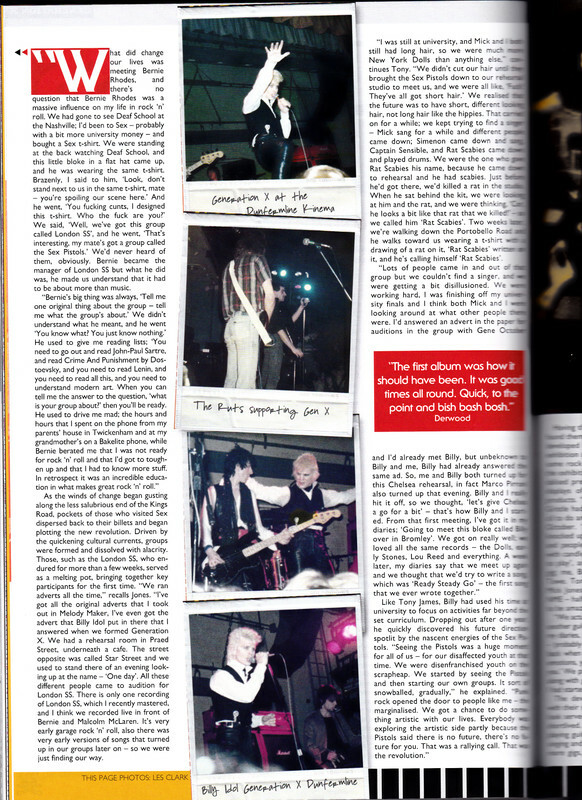 Interview with TJ in Vive le Rock about early life. Of particular interest is details of a newly mastered recording of their one and only recorded session. Difficult to read that but is it something this is going to be released? It would be amazing to hear as a piece of musical history. Not without MJ's approval and if past experience is anything to go by, it'll be an emphatic NO. Conversely i think TJ would release it tomorrow if he could. I think TeddyB previously said Mick would never release it. In the hope that he can release it? It would be an interesting historical footnote for the devoted. Curious to know why Mick wouldn't want it released? He's mastered it mate. Not remastered it. You (or Marky)may have more of an idea than me, what that means. I'm not studio minded at all. Him and Idol have been putting a Gen X package together for new year release. Maybe he has come across it during all the digging and fancied doing a job on it, or maybe as The Kid said, he might think there's a chance he can get it out there. Him and Idol have been putting a Gen X package together for new year release. London SS tapes aside, this is great news (which may not be news to others, but certainly the first I'm hearing of it). Does MJ have the right to say no? Sounds like TJ owns the tape and back then MJ wasn’t the main player so why would he have the power of veto? He does. They were the two main players. TJ can’t use Mick’s performance (legally) without a deal, nor would he, as they are still good friends. Tony has the gift of gab, maybe he’ll talk Mick into it someday. As White Man pointed out, Tony has been working on a Generation X release. It makes sense that while he was doing so, on someone else’s dime no less, he figured to clean up all his old tapes of interest. Or maybe he’s got a notion to ask Mick if he can use a track on the Gen X box, maybe with some Chelsea stuff, to show the early days. They mentioned it on Jonesy's Jukebox. That's why they were in LA. TJ has been digging really deep into his archives and it seems he's more of a hoarder than MJ. I do respect any view that Mick may have regards the London SS tape or indeed tapes. However it's simply gotta be time to get it out there before any of us that still care about this stuff stop caring. Probably what he's banking on. Mick & Tony have a tape for sure. But I wonder if others have tapes like Brian James or Roland Hot. The tape Mick has allegedly features Mick with Tony James/Brian James/Roland Hot. I think it may contain 1-2 Crush on You/Fish/Why Won't She Talk. I also wonder what tapes Geir Wade might have of London SS and Violent Luck.